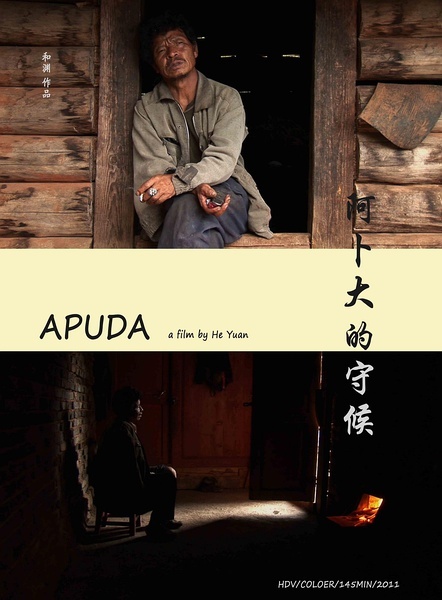 Apuda is meditative, slow, mesmerizingly beautiful ethnological/visionary documentary by young director He Yuan. He is a researcher at the Institute of Ethnography of the Yunnan Academy of Sciences. His film records--more than records, it transmutes into a virtual rural epic poem--the life of Apuda, an orchard farmer from the Naxi minority who live in southwestern China's Yunnan province. Apuda lives with his elderly bed-ridden father. The father is slowly slipping towards death. Apuda himself is the kind of extraordinary figure that many of China's independent documentary makers have been particularly fascinated by lately: he's mildly mentally disabled, though more than able to manage a singularly ordered and independent life of severe poverty. Apuda's language, too, is fascinating, as he talks largely to himself (and sometimes to his father, and very occasionally to rare visitors) with a distilled, articulate, quasi poetic voice whose every word one wants to hang on to.